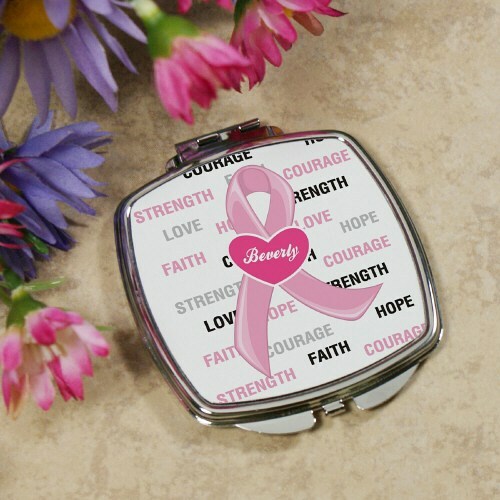 Show your support and increase awareness with this Personalized Breast Cancer Ribbon Compact Mirror. Make it a wonderful Breast Cancer Gift to someone suffering with this disease to encourage health and wellness. Your Custom Printed Compact Mirror measures 2.5" x 3". Includes FREE Personalization. Personalize your Compact Mirror with any name. Help spread awareness with Personalized Breast Cancer Awareness Apparel and Walk Gear from MyWalkGear.com. For each purchase made, we will donate a portion of the sales to the Susan G. Komen Foundation to help find a cure.